Designed for highest temperatures without forced air. The 35 Hand Torch LP has the burner set at an angle. This makes the torch easily balanced when using. They are equipped with lever handle valves and pilot lights. 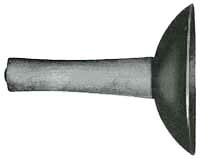 The valve is operated by the hand holding the torch and is instantly turned on and off as desired. The No. 35 Torch is used when greater capacity is required for singeing poultry. The long bunsen tube makes the torch light and easy to handle, produces long, bushy flame. Excellent balance, easy to operate. Ideal for singeing hogs. Only 15 inches in length and 1 1/4 pounds in weight. Gas input is 45,000 BTU/hour. 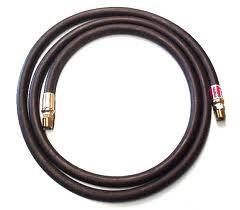 35 Hand Torch Neoprene Gas Hose Assy.